-Read the excerpt below from a Curtis Houck post at Newsbusters. On Monday, several sources in the intelligence community disputed President Obama’s comments in an interview with CBS’s 60 Minutes that aired on Sunday night that the intelligence community and Director of National Intelligence Jim Clapper are to blame for not recognizing the threat posed by ISIS. NBC Nightly News offered a stark contrast as it aired a two-and-a-half-minute segment that included not only Obama’s comments, but congressional testimony from intelligence officials over the past year warning of ISIS and reports from NBC News chief foreign correspondent Richard Engel going back to January that both cited the falling apart of the Iraqi army in being able to hold territory and losses in territory to terrorists that U.S. troops had secured during the Iraq war. An administration source told the Daily Mail on Monday that the President had “provided him with specific information since before he won re-election in 2012” about the threats and potential of ISIS. Over in an article posted on The Daily Beast, a source said that the President’s own senior intelligence officials had been telling him “that ISIS was on the move.” The article described how one former Pentagon official who worked closely on matters regarding Iraq and Syria was“flabbergasted” with what the President had said. [T]he Obama administration had options on the table to target senior leadership of ISIS — as well as the al Qaeda-aligned Khorasan Group — in the 18 months leading up to the strikes in Syria which began last week. NBC News chief foreign affairs correspondent Andrea Mitchell reported that “[t]he ISIS threat is not a secret, say intelligence leaders, to anyone watching or listening” and “[t]here were alarm bells” in the run-up to the current landscape of the Middle East with ISIS controlling large portions of territory in Iraq and Syria. All together, Mitchell showed five separate clips from January to June that contradicted the President’s claim that intelligence community underestimated ISIS. In addition to two clips from Engel, there two clips of separate congressional testimonies from a State Department official and intelligence official that warned of the desire of ISIS leader Abu Bakr al-Baghdadi to gain large swaths of territory across the Middle East and described how Iraq and the region was becoming “increasingly a concern” the U.S. should monitor, respectively. 1. What type of bias do ABC and CBS exhibit in their reports? 2. Why do you think ABC and CBS did not report that many in the intelligence community say President Obama did know about the threat of ISIS? 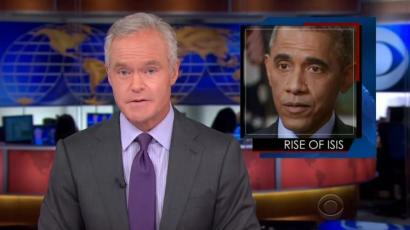 SCOTT PELLEY: The rise of ISIS, also known as ISIL, was a surprise to U.S. intelligence. President Obama acknowledged that and another intelligence failure to Steve Kroft, in an interview for 60 Minutes. STEVE KROFT: How did they end up where they are in control of so much territory? Was that a complete surprise to you? PRESIDENT BARACK OBAMA: Well, I think our head of the intelligence community, Jim Clapper, has acknowledged that I think they underestimated what had been taking place in Syria. KROFT: I mean, he didn’t just say that we underestimated ISIL. He said we overestimated the ability and the will of our allies the Iraqi army to fight. KROFT: And these are the people we are now expecting to carry on the fight? OBAMA: Well, here’s what happened in Iraq: When we left, we had left them a democracy that was in tact and a military that was well equipped and the ability for them to chart their own course and that opportunity was squandered over the course of five years or so because the Prime Minister Maliki was much more interested in consolidating his Shia base and very suspicious of the Sunnis and the Kurds, who make up the other two-thirds of the country. KROFT: What’s the end game? OBAMA: I’m not going to speculate on failure at the moment. We’re just getting started. Let’s see how they do. I think right now we have a campaign plan that has a strong chance for success in Iraq. I think Syria is a more challenging situation. PELLEY: Today, the White House said Mr. Obama has confidence in the intelligence community and Director Jim Clapper. BRIAN WILLIAMS: Tonight, a paper trail is emerging of warnings about the growing threat of ISIS as far back as last winter. This comes as President Obama made a notable admission on national television which is now raising questions about how the red flags went unheeded by the intelligence community and the White House for so long. Our report tonight from our chief foreign affairs correspondent Andrea Mitchell. ANDREA MITCHELL: The ISIS threat is not a secret, say intelligence leaders, to anyone watching or listening. Despite what the President told 60 Minutes. RICHARD ENGEL [ON 01/05/14]: The gains that were achieved by U.S. troops in Iraq, very hard fought gains, have now been wiped out are or being wiped out. MITCHELL: A month later, Congress is told about the ISIS leader, Al Baghdadi. DEPUTY ASSISTANT SECRETARY FOR IRAQ & IRAN BRETT MCGURK [ON 02/05/14]: His mission is clearly stated in his own statements is to carve out his own governing territory from Baghdad to Syria to Lebanon. MITCHELL: Front Line airs a documentary on ISIS victories in Syria. FRONT LINE NARRATOR [ON 02/11/14]: The group wants to establish an Islamic State in Syria. LIEUTENANT GENERAL MICHAEL FLYNN [ON 02/11/14]: It’s an increasingly a concern that we’re going to have to pay very close attention to, not only inside of Iraq, but for the whole region. ENGEL [ON 06/11/14]: Some Iraqi security forces are fighting, but most appear to be stripping off their uniforms, leaving them in the streets and abandoning their posts, weapons and vehicles. MITCHELL: Now the Pentagon acknowledges just how surprised it was by that. REAR ADMIRAL JOHN KIRBY: What surprised us certainly from a military perspective was how quickly they moved into Mosul over the summer, how fast that went, their progress up north, as well as the way four or five Iraqi divisions kind of melted away. MITHCELL: So is this an intelligence failure or is this a failure of policymakers all the way up to the President of the United States? MICHAEL LEITER: Those warnings were clear and loud, at least over the past two years in my view. MITCHELL: Bottom line, there are two issues here. The White House was repeatedly warned about the ISIS threat, but despite plenty of news reports, military and intelligence officials, completely misjudged the Iraqi army’s ability to stand up and fight back. Brian. WILLIAMS: Andrea Mitchell in our D.C. Newsroom tonight. Andrea, thanks.